Simon Thacker is an Edinburgh-based classical guitarist whose collaborations have taken him well and truly cross-cultural. His previous disc Rakasha (see my review) was with Simon Thacker's Svara-Kanti an Indo-Western collective. 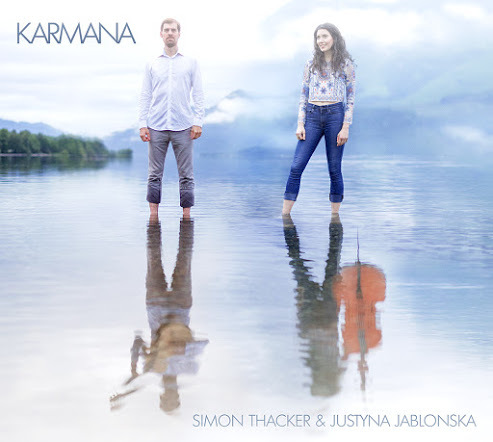 On this new disc Karmana he collaborates with Polish-born classical cellist Justyna Jablonska. In addition to the title track, which Thacker and Jablonska play as a duo, they are joined by guest artists Karine Polwart (Scottish traditional song), Masha Natanson (Roma song) and Sarvar Sabri (tabla). Karmana is a Sanskri word meaning 'performing anything by means of magic'. Thacker sees the music as a natural extension of his exploration of ragas with Svara-Kanti. For Karmana, Thacker uses a different guitar tuning which allows him to develop the sonorities he wanted. There are six movements with evocative names, Initiation, Albedo (an alchemical term), Half Moon Dreaming (a quote from the Egyptian Book of the Dead), Ourobouros (symbol of a snake biting its tail), The Chariot of the Mind and Finale. But there is a fluidity to Thacker's writing, perhaps arising out of his improvisation, so the movements flow into each other and create a satisfying whole. What was noticeable on first listening was the sheer texture or rather textures of the piece. Thacker really explores what it means for a cello and a classical guitar to play together, creating a new sound out of two separate ones. The opening has a very Spanish feel, and often Thacker uses Spanish guitar figurations in the music, how could he not, but the harmony moves widely. Cellist Justyna Jablonska gets her moments; Half Moon Dreaming gives her a lovely soulful moment. Thacker keeps the music flowing and there is a lovely sense of interaction between Thacker and Jablonska so that they make very engaging music. The faster movements get vividly toe-tapping, but there is rarely a hint of casual pastiche, the music is always its own self. Obyrtac is based on a traditional Polish tune re-imagined by Thacker, again featuring a lovely solo from Jablonska, lyrical but with magical little flurries. La Carciuma de la drum is a traditional Roma song (the title means 'At the pub down the road') where Thacker and Jablonska are joined by Masha Natanson providing both vocals and violin, creating some fabulous sounds with her exotic inflections to the melodic line. An t-larla Diuach is a traditional Gaelic song which gives a lyrical melancholy line to Jablonska with atmospheric guitar contributions from Thacker. Ruaigidh Dorchados (The Highland Widow's Lament), is far more than an arrangement of a traditional Scots song. Thacker has created a whole orchestra texture by using electronics to re-process the instruments and his twelve minute piece surrounds Polwart's vocals with a series of interludes and accompaniments which develops as a remarkable commentary on the the narrative of the song, at times becoming quite dark and angry. Finally Aruna sees the intriguing combination of guitar, cello and tabla, with Sarvar Sabri. Simon Thacker's music is very much sui-generis, not world music nor strictly classical, but an intelligent co-mingling of the two . This is the first disc Thacker has made where all the tracks are his own compositions, and you sense that there are plenty of starting poins here for future collaborations. If you enjoy fine musicality and a questing spirit, then try this disc. Album available from Simon Thacker's website.